I keep talking about this May 15 deadline, but it's actually sooner than that. 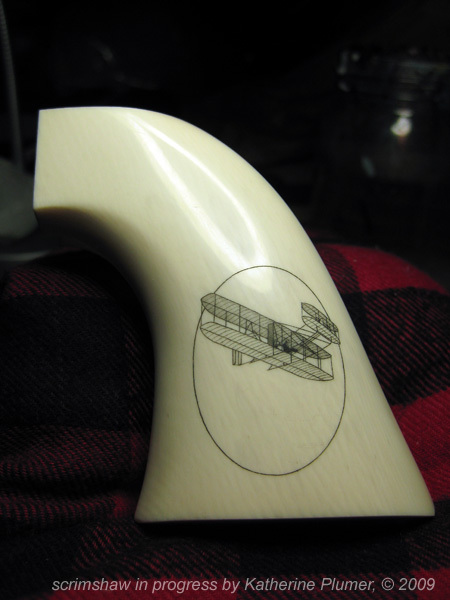 The CCA grips need to be back in the hands of the engraver on or before that date, so I am planning to ship them out on or before the 11th, which means I need to be done on or before the 10th (and if you know me you know this probably means I'll be finishing about 2am the 11th, but let's hope not). I feel like I'm on track with this, just need to focus and work like mad for the next 14 days. 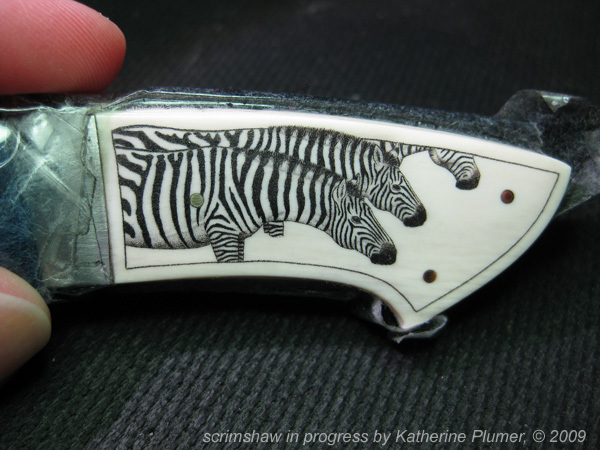 The zebra knife also needs to ship out that week. Eek! Q: What's the weird light area/reflection on the grips? A: That's the reflection of the fluorescent ring light underneath the microscope. The grips are sitting under the scope when I take these photos. Q: What happens if you mess up? A: Messing up really is not an option. Extremely minor messups can sometimes be sanded off and buffed away, or you can try to fudge it and somehow incorporate your mistake into something else. But for all practical purposes, it would be the end of the world. (Yeah, no pressure or anything).